But, how do you actually go about publishing a new app to the App Store. Here’s the process I recently went through to publish RememberThis – a new app which helps you stay on top of things by reminding you about important conversations that need following up. The App Store is a walled garden, meaning that any apps that go into it must be approved by Microsoft. This is done by the Office Store team, who will make sure that your submission falls within the published guidelines. 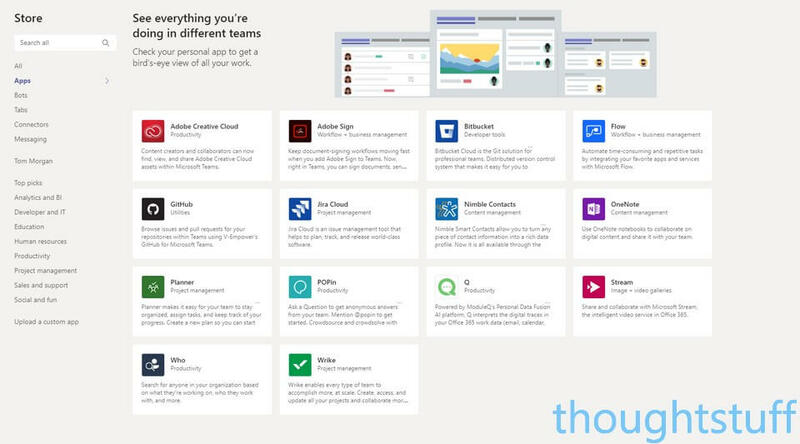 In addition, for Teams apps they will also ask the Microsoft Teams product group to inspect your application. 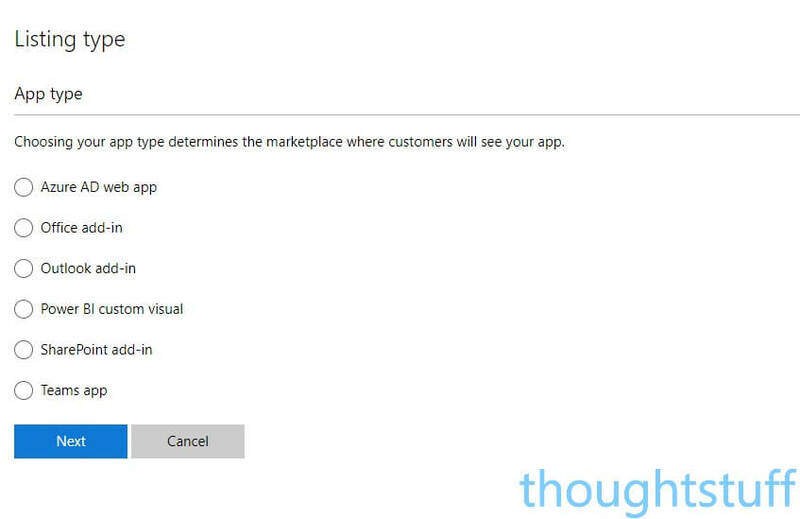 The Teams product group will take a closer look at how your application performs within Teams and will cover things like the how your app looks to users, what the first-run experience is, how your application copes with unexpected input etc. Your app is going to get a fairly thorough inspection before it’s approved, so it’s worth making sure everything is as good as it can be before you submit. Not only is it advisable reading through the App Store Validation Policies, which cover general rules, but it’s also well worth looking at the specific guidance for Teams apps as well, which covers detail such as how your icons should look as well as links to other design guidelines for Teams apps. It’s 2018, and publishing apps is a Serious Business. 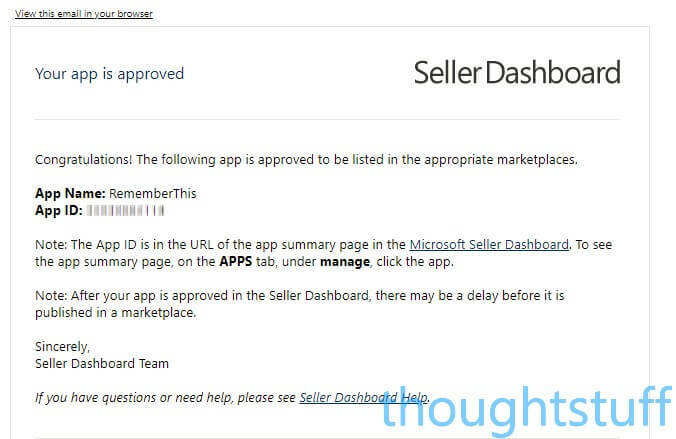 If you’re going to be allowed to put your app into Microsoft’s App Store then you need to be registered with a Seller account – even if the app is free. Note that the charge applies even if your apps are free. However, the good news is that this is a one-time fee, not an annual occurring one. Once you’ve registered then your application is placed into “Pending Approval” status whilst your account information is verified. For me, approval took around 12 hours, and you’ll receive an email when it happens. You’ll need to upload your manifest ZIP file, as well as provide some information about the app’s name, category etc. Top Tip: make a note of the ‘common failure reasons’ highlighted at the top as this is updated regularly based on actual failures so can help you to avoid potential pitfalls. your app logo. This can (probably should) be the same logo that’s in your manifest, but note that it must be a .png, .jpg, .jpeg, .gif, must be exactly 96w x 96h pixels, and must be no greater than 512 KB. some screenshots. You have to provide at least one, which must be .png, .jpg, .jpeg, .gif, must be exactly 1366w x 768h pixels and no greater than 1024 KB. The screenshots are verified by a real human and need to be of a pretty good standard. 1366×769 is quite a large size, so if your app is a bot without any tab pages then it can be hard to show that without compromising on quality. There are some tips on how to provide good screenshots here, which I highly recommend you read. I fell down on this – as you’ll see below. As part of the app creation process, you can also integrate with a CRM system if you have one. Yep, you can’t charge money for Teams apps. The pricing section in the app creation wizard only lets you choose “free app”, there are no other options. Once you’ve filled everything in, click the final Submit button, and then you’ve done all you can for the moment. Your app will go into the submission queue. I called this section “wait for feedback” rather than “wait for approval” because nearly everyone needs to submit their app more than once before it’s approved (source). This page contains the actual link to the testing report. The report is a PDF file which you can download for reference. 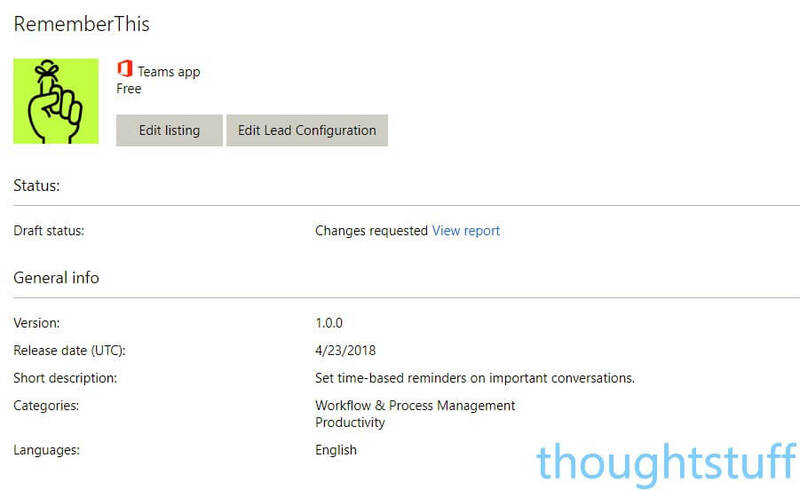 Be aware that if you go back to your app in the Dashboard and start making changes, you reset the status to Draft and won’t be able to access this report again, so take a copy now! The test report is well laid out, with plenty of information about the result, and why. Here’s the start of my report. You can see my first required change is regarding the screenshots I provided. The result clearly defines what is wrong, how I can improve it, and links to more information. 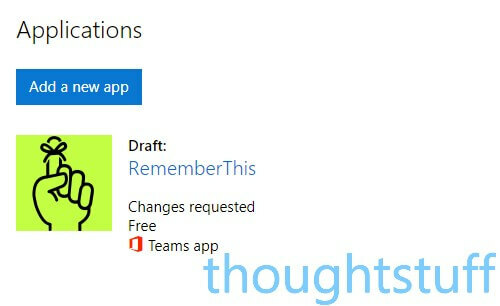 Your app was rejected because it has not yet passed the Teams-specific guidelines described here: http://msteamsdesignguidelines.azurewebsites.net/#!/ Please email this report and your manifest file to [email protected] for further resolution steps. 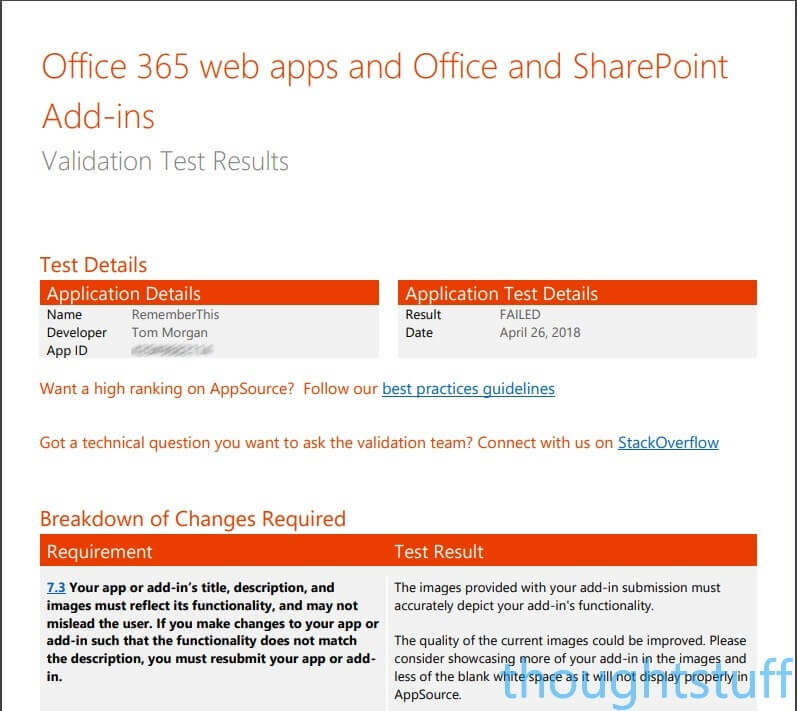 Please note that the Office Validation Team cannot provide any support for this topic and will not validate any further resubmissions of your app until you have engaged with the Teams app support team over email. This integration could be better, but it’s not too bad. Basically, you now have to email the address quoted with a copy of your manifest file (the zip file, not the JSON) and a copy of the test report, and ask them to validate it. Again, I found this team to be very responsive and detailed in their reply. Within 24 hours I had a personalized reply and it was clear that my app had been put through its paces. Any issues had been clearly articulated, along with recommended steps to take. This is what App Store submission should be like: your app is being tested and validated by people who clearly know exactly what they are doing and are committed to working with you in the best interests of the App Store. They don’t feel like gatekeepers trying to find reasons to reject, it really does feel like they’re doing their best to help get your app into the Store. There’s no point in re-submitting your app until you’ve got the go-ahead from the Teams team. Once they’re happy then they will mark your application as having passed, so that the Office Store team know. Provided you’ve also addressed any issues that the Office Store team have, re-submit your application by going back to the Seller Dashboard and clicking “Submit Draft for Approval” again. From this point, it can still take a few days for your application to trickle down to the App Store in all regions. It’s worth waiting and double-checking that your application is showing in the App Store before you start telling everyone about it! Hopefully, that’s been a useful blow-by-blow of what it takes to publish an app into the Teams App Store. If you still have questions, let me know in the comments and I’ll do my best to answer them. Hey Tom, thanks for posting this blog article. I was interested if you could say something about downloads and engagement for your app, what could one expect? Was it worth it? Thanks!